We stayed at Salmon Leap Farm during our visit to Killarney and the surrounding County Kerry. Sean was a wonderful host. The view was beautiful, the room was very comfortable and the food was delicious. We would definitely recommend this Bed and Breakfast. We enjoyed our stay and time so much at this lovely place, I would have loved to stay longer. The hosts were generous with their tips, which were all spot on, by the way. and helpful with everything from directions to luggage. The breakfast is homey and lovely too. Very nice receipt, beautful bedroom, fine breakfast . Situated near the main street. We really enjoyed staying with Sean and his family. I don't know what it is, but I slept better here than any other place in my life. One of the best places I have ever stayed! They owners were very easy and pleasant to be around. They were very knowledgeable about the area and even showed us how to use the GPS and helped us program it for our next destination. I will definitely stay with them on our next visit! The Salmon Leap Farm Inn was the perfect place for us to stay as we explored County Kerry. We had a great room over looking the farm with a beautiful mountain view. It was quiet and spacious with a newly updated bathroom, so needless to say the room was overwhelmingly comfortable. We had the best nights of sleep and best full Irish breakfast of our Ireland vacation. Moreover, Sean was absolutely the best host giving us a tour of the ancient archeological site on the grounds as well as going above and beyond to help us with anything we needed. 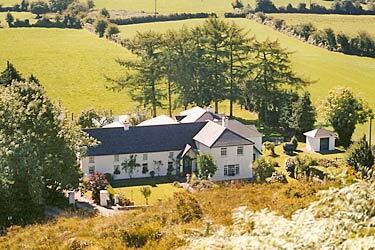 I would HIGHLY recommend the Salmon Leap Farms Inn to anybody who would like a peaceful, comfortable, and all-around great time staying in Killarney. Beautiful views and the room was very comfortable. Sean was very helpful in finding a local place to eat dinner and the breakfast was great. I would definitely stay here again. Had a very happy 5 days stay at this B and B. Sean and mother very welcoming and both helpful and friendly. Helped us greatly with planning our trips around Ring of Kerry,Dingle and Beara peninsulas. We stayed in late June. We very much enjoyed our stay. The environment is so peaceful and quiet. Even though the property is on a major road, there was no road noise whatsoever from our room, nor do we have direct line of sight to the road. All we see is the green pasture, the hills in the distance. Definitely a nice change of scenery for the city dwellers. The service provided by Sean and his team is first class. Knowledgable, helpful and just right. We had a wonderful time. Salmon Leap Farm provided a fabulous experience for my grandson and I while we stayed June 6-8. We were welcomed warmly by Sean and his delightful mother, and the country setting was so serene we were able to relax. Sean gave us a history of the Farm which had been in his family for 3 generations. Our room was so comfortable and quiet, breakfasts were outstanding, and Sean provided very useful advice about sites to see that weren't listed in the literature, around Killarney. It was a wonderful memorable experience. We would recommend this B&B as one of the best in Ireland for our 10-day visit. Thank you Sean and family and staff. Great stay and really good service over all. And so nice welcome from the management. We were there for the fourth time. One of our preferred B&B in Ireland. Thanks Sean. Salmon Leap Farm is a jewel. Sean was so kind, as was his lovely mother. They welcomed us graciously and the time spent there was wonderful. Such a clean, comfortable place. Sean showed the burial site to us and gave us an outstanding history lesson. He also gave us tips for driving to, and in, Killarney. My husband and I would recommend this B and B to everyone. It was actually one of the lower priced B and Bs that we stayed at, yet roomy and exceptional. It was perfect. Thank you Sean and family. Beautiful B and B in a convenient location. On our first day there we were welcomed with a tea service. The staff were welcoming and accommodating. We stayed at Salmon Leap Farm for three nights. Our room was very nice and cozy. Breakfast was delicious. The B and B also has an environmental conservation policy, which we really appreciated. The only negative thing was that there was only wifi access in the common areas. It wasn't a big problem but it would have been nice to be able to be in our room and plan the next day of our vacation or check emails rather than in the living room. We would stay here again. We loved it! Great room and house - food delicious - great hosts!!! Highly recommend!! Beautiful house and the rooms were large and very comfortable. Breakfast wonderful and lots of different choices for all tastes. Sean is very helpful and really makes you feel welcome. Had 4 wonderful days and nights in Count Kerry and Salmon leap. Salmon Leap is our favorite B&B. It is comfortable and Sean is most welcoming. It is conveniently located yet out of the hustle and bustle of major tourist areas. After a great nights rest, a wonderful breakfast starts you on another day. My boyfriend and I had a fantastic time at Salmon Leap Farm! We had booked the B&B in advance believing we would have a rental car; however, when we arrived in Ireland we learned that the cost of the rental car was out of our price range. We had to take a taxi out to the B&B it is a little ways outside of town and were worried about having to take taxis around the next day that we were in Killarney. Turned out to be no problem because Sean was kind and not only took us into town in his car, but also showed us exactly where we could go to rent bikes and have a wonderful day in Killarney National Park. We are very grateful for his generosity! We also loved the Irish breakfast, the room we were given, and getting a tour of the ancient burial site on the grounds of the B&B. We will absolutely be back the next time we were in Ireland...next time with a rental car! We were so happy we stayed at Salmon Leap. It was the most peaceful part of our trip through Ireland. The room was a great size, the bathroom and shower was awesome as well. The view out the back of the property is amazing. We received excellent service while here, and enjoyed our coffee/tea in the afternoons sitting by the cozy fire. Salmon Leap was one of the best experiences I have ever had at any B&B. The proprietor was friendly and very professional; the room was ultra-clean, the breakfast great, the locality stunning and the proximity to town just lovely. I can recommend Salmon Leap with a very clear conscience; a great place to stay, and very convenient for the journey onwards to Cork. Charming B and B perfectly located to tour The RIng of Kerry and the DIngle Peninsula. Historical home with all the amenities. quiet, large home, great breakfast. Even some cattle out back to photograph! The owners were so kind and helped us with directions to everything. WIll stay there again on our next visit to Ireland. Just wonderful! We had a very nice stay at Salmon Leap Farm. Sean was very helpful and the breakfast provided was very good. Nice to be out of the town and in the beautiful countryside. Salmon Leap Farm was one of the most unique B&B experiences during my week long trip to Ireland. It's hard to believe that the farm is 200 years old since the facilities have been updated - a great combination of old and new. The host Sean practices green tourism including natural soaps and toiletry products, suggestions for low environmental impact activities. He is also very knowledgeable about local history including a historical location on the property. The location is within easy driving distance to Killarney and the Ring of Kerry. Last but not least, the hospitality and breakfast were exceptional. Our stay at Salmon Leap farm was definitely the highlight of our week in Ireland. Everything about our much too short visit was outstanding. We especially appreciated Sean's concern for our comfort, his family's/property's rich history, and for the environment. We can hardly wait to return, and would definitely stay longer the next time! Thank you, Sean! This was the most wonderful B & B. The high point was when the owner, Sean, showed us a couple of archeological sites on the property that were fascinating. We highly recommend. We loved the place, the room was cause and clean, breakfast perfect and Julie was very helpful and nice. Good atmosphere. Salmon Leap Farm is AWESOME! It is a beautiful property in an excellent location with clean, wonderful rooms. Sean always made us feel at home and was very helpful with suggestions and a direction for the day of sightseeing ahead. Breakfast was delightful especially the porridge and brown bread. Loved our Stay!!!! Excellent value for money. The host was very welcoming and personable. He took us for a personal, guided tour of the ancient ruins on his property. His knowledge of the local history and the ancient ruins were fantastic. The rooms were very well appointed and the food was great. This b&b was of a high standard. The house and surroundings have lots of character. Our room was beautiful and had everything we needed. We had a choice of breakfast which came promptly & lived up to expectations. Above all though was the standard of hospitality...the owners were so nice & helpful. Will definitely stay here again. I loved everything about Salmon Leap Farm. The hospitality couldn't be beat. Sean was everything you would want in a host. A great location, beautiful views, excellent hospitality, a wonderful room in which guests could socialize, and an excellent breakfast. The only negative was that I had only booked one night. I should have spent more than that and will upon a return to the area. We thoroughly enjoyed our stay at Salmon Leap. Sean was most helpful and attentive, with great advice for touring the area. Breakfasts were outstanding with very prompt service in pleasant surroundings. Our double room was comfortable with an excellent power shower and suited our needs. Loved the area and were glad to have had three days to explore. Thanks for your kind hospitality. We had a lovely stay at Salmon Leap, unfortunately we were only stopping over for one night, once we saw how beautiful the surrounding area and accommodation facilities were, we were sorry we didn't have more days available to explore. Shaun and his family are warm, friendly and helpful. They've really worked hard to offer quality accommodation facilities showing off the best of the beautiful environment they live in. We would definitely love to come back! My wife and I stayed at Salmon Leap Farm last week and were treated like royalty by Sean. A warm, beautiful and inviting home, spacious bedroom and fantastic breakfast and conversation. We would highly recommend Salmon Leap Farm to anyone visiting this area. Chances are good that we will be back in a few years and we would like this to be the place to stay once again. Thanks! Staying at the Salmon Leaf Farm was a perfect experience for us. We enjoyed the country atmosphere and convenient location for touring the area. Sean was an exceptional host assisting us with helpful suggestions and directions. We would very much like to revisit the Salmon Leap farm. Excellent showers! Perfect temp and great pressure. Sean was very nice to talk to. Very accomodating, nice fire and cup tea provided on our arrival. Mr. O'Donoghue was very freindly and helpful going the extra service of providing air for our nearly flat tire. Very nice, spacious rooms in a large, quiet, comfortable, and spotless house on an interesting property. Location 14 km from the center of Killarney was an easy drive to and from town, while away from the bustle. Sean O'Donoghue was a perfect host. Salmon Leap was recommended by friends who stayed there, and I heartily endorse their recommendation, and hope we can return.